Star Wars: Galaxy’s Edge is opening up at Disneyland in June and there are some rumors about what fans can expect from the dark ride Star Wars: Rise of the Resistance. First, a dark ride is simply, “an indoor amusement ride on which passengers aboard guided vehicles travel through specially lit scenes that typically contain animation, sound, music and special effects” (Via Wikipedia). Second, /Film reportedly has put together a rough estimate of what fans can expect from the ride. Their sources point to the attraction taking 28 minutes from start to finish which should be joyous news for the fans that will inevitably be waiting for hours on end. 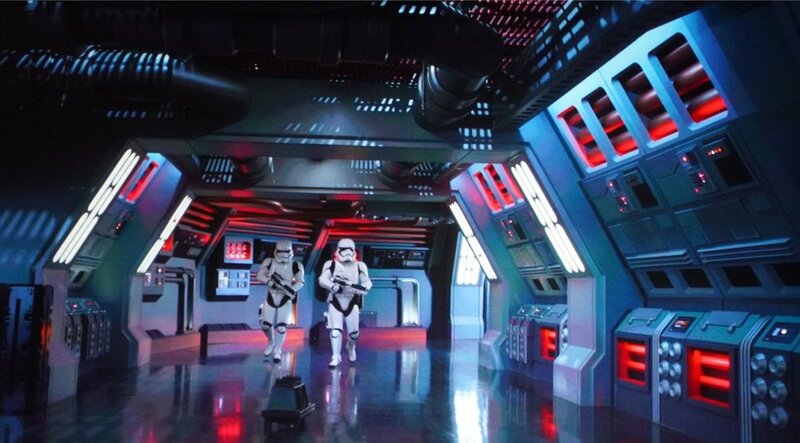 Fans will be treated to 18 show scenes, 5 different ride systems, and 305 animatronic figures and droids. The rumors for the story indicate that you’ll be recruited as a member of the Resistance and end up in a Star Destroyed above Batuu. You’ll encounter Stormtroopers, Kylo Ren, possibly General Hux, and even AT-AT walkers. You’ll be driven on vehicles piloted by droids which are eventually hacked by the Resistance to help you escape the Star Destroyer. If you want more of a play-by-play of what to expect, you can always head to the original article. This sounds like a really fun attraction, although I do hope there is a bit more of an interactive element to it. Are you excited for Rise of the Resistance, or are you more excited for Smuggler’s Run?